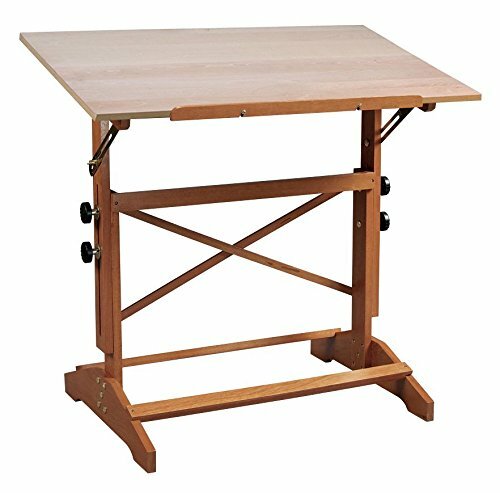 What We Like About This Drafting Table A great-looking natural addition to your home studio. The wood frame is reinforced many times with various cross beams and triangular pedestal supports. Comes with a natural finish top with rounded corners and black vinyl borders. The base is always CHERRY regardless of the top finish. A Word from the ManufacturerAlvin and Company has been a leading source of drafting and drawing supplies since 1950 and it continues to meet the evolving needs of its customers with value and innovation. The ever-expanding range of Alvin products includes papercraft fine arts hobby and craft drafting supplies drafting tables and more. Alvin serves today's needs - and tomorrow's- for graphic arts drafting and fine arts products. Dedicated to the pursuit of excellence in all aspects of its business Alvin relies on its employees to create and develop opportunities that set it apart from the competition.